The United States is a divided nation following the presidential election, and who better to demonstrate that than campaign insiders? What was meant to be a frank but courteous panel discussion at Harvard University quickly devolved into a shouting match between Hillary Clinton's and Donald Trump's aides. The university's Kennedy School of Government has sponsored a two-day forum following presidential elections since 1972, with the intended goal of documenting the history surrounding the campaign. Unfortunately, Clinton's and Trump's aides engaged in yet another contentious conversation; according to CNN, aides on both sides rolled their eyes, interrupted each other frequently, and even yelled during a forum. While both Clinton's and Trump's teams claimed their candidate was treated unfairly in terms of press coverage, each side had its own negative assertions to make about the opposing party. Trump's team reportedly gloated about their victory, with senior Trump adviser Kellyanne Conway calling Clinton team members "bitter," and saying Trump won because he was the "better candidate," CNN reported. "Guys, I can tell you are angry, but wow," Conway reportedly said. "Hashtag he’s your president. How’s that? Will you ever accept the election results? Will you tell your protesters that he’s their president, too?" On the other hand, Clinton communications director Jennifer Palmieri was emotional while discussing Trump's appointment of Steve Bannon, the former chief executive of so-called "alt-right" website Breitbart, as chief strategist. "If providing a platform for white supremacists makes me a brilliant tactician, I am proud to have lost," Palmieri said, according to the Washington Post. "I would rather lose than win the way you guys did." 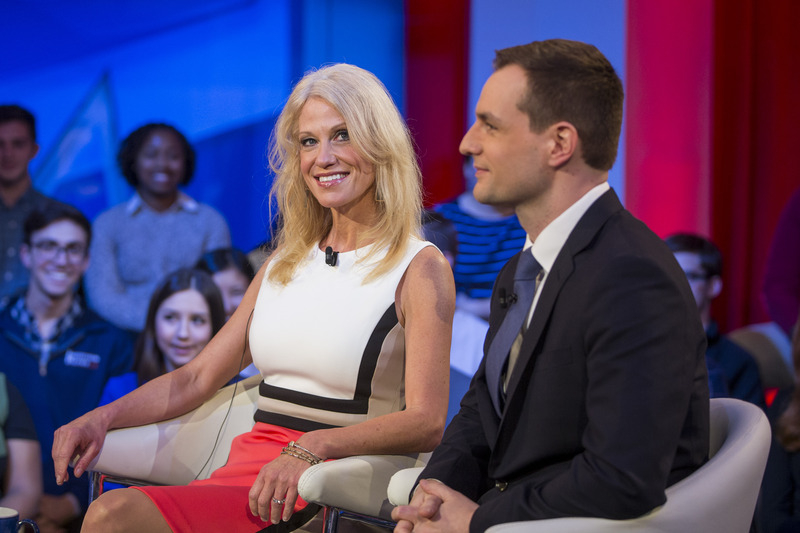 Kellyanne Conway shot back, asking, "Do you think I ran a campaign where white supremacists had a platform?" And yes, Palmieri did respond to that question in the affirmative. After seeing how Clinton and Trump's aides spoke to each other during their supposed-to-be civil meeting, it's not hard to believe how large the partisan divide in America is following the election. Rather than finding a common ground with Clinton's aides, Conway, whose Twitter bio simply reads "We won," responded combatively to valid concerns brought up by the Clinton team. But that's not to say either side is solely responsible for the disrespectful behavior at the conference; interruptions abounded across the line. At one point, Clinton campaign manager Robby Mook interrupted a Trump aide to point out that Clinton "won the popular vote." Trump's aides' words however, seemed to echo the president-elect's words at an Ohio stop during his "Thank you" tour. While at first he proclaimed that "we are not going to be divided for long," Trump went on to say, "We did have a lot of fun fighting Hillary, didn't we?" to a crowd that was chanting "Lock her up!" Trump also insulted Ohio Gov. John Kasich and once again called the media "dishonest." None of this behavior seems particularly cooperative or undivided. If Trump and his team truly want to bring America together, they'll have to change their current antagonistic behavior toward their former opponents. An earlier version of this article incorrectly stated that the dispute between Clinton and Trump's aides happened at a Dec. 1 event entitled "War Stories: Inside Campaign 2016," hosted by CNN's Jake Tapper. The meeting in question was actually a different postmortem session hosted by Harvard University's Kennedy School Institute of Politics.